The StartUp Britain Summer Bus Tour kicked off in full force this week with the StartUp Britain team and a host of entrepreneurs hitting our first stop – Bristol’s creative hub: Paintworks. 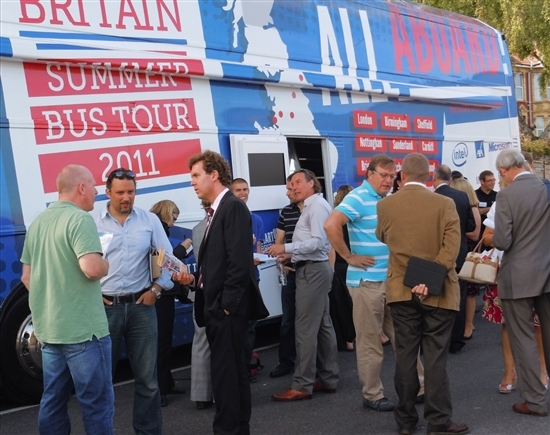 As a member of the StartUp Britain team I’ll be onboard the StartUp Britain bus alongside experts from companies including Dell as it travels the UK throughout August and September bringing advice and inspiration to those looking to start their own business. Monday’s stop at Bristol was met with an overwhelmingly positive response with local entrepreneurs getting involved including Rob Law, Founder of Trunki and Charles Francis, Founder of start up business Lick Me I’m Delicious. Eager to share their own unique experiences with the would-be start-ups, entrepreneurs and business experts were stationed onboard the bus to help give valuable tips and insight to those who joined us. From midday the bus then rolled onto Cardiff where our striking double-decker caught the attention of hundreds on a buzzing Queen Street. Neil Cocker, Founder of Dizzy Jam was on-hand to provide speed mentoring while Cardiff’s ROCKTAILS, passionate about entrepreneurialism, were handing out their signature frozen drinks alongside advise to would-be start-ups. Tuesday saw the bus make its way to Victoria Square in Birmingham where many passer-bys and aspiring entrepreneurs hopped onboard to share and discuss their creative business concepts and it was fantastic to see those who joined us leave with the know-how and even more enthusiasm to get started. Along with our seven other founding sponsors, Dell is joining us in each of the fourteen regions we’re travelling to on the tour with the sole aim of giving encouragement and expert business advice to all who join us. Don’t forget that StartUp Britain is giving away a free Dell Vostro 3450 business laptop, with the latest i5 intel processor worth £650! Find out about where the bus is heading next, as well as our September dates, here.